With running lights you create amazing effects in a simple way. That’s no problem with a Raspberry Pi and some Python code. Even with Lazarus and Free Pascal is easy and visualization is cool. Lazarus is a Delphi-like programming language for many platforms based von Pascal. The basic version of Lazarus still has no functions or classes for programming the GPIO pins on the Raspberry. But there are some ways you can code with pins. An overview is the Wiki at http://wiki.freepascal.org/Lazarus_on_Raspberry_Pi . I use the package PascalIO for this project . Download it and save it in your Larazus library. For a first test start a new Lazarus Project. Add the package PascalIO. 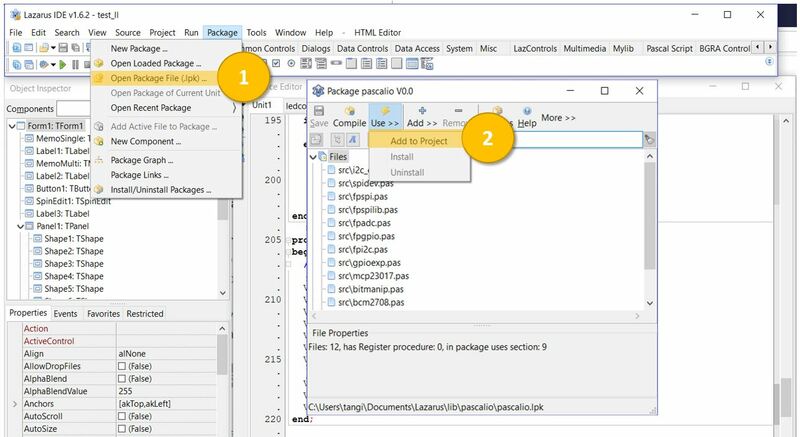 The easiest way by the package via the menu item package is loaded from your folder. By clicking on the Add to Project it is available for your project. The use of PascalIO for GPIO programming is very simple. In the first step is to add the needed units. If only GPIO need to be connected, it is only the unit fpgpio. In this example a LED is connected via a resistor of 330 Ω. The program toggles the GPIO18 from LOW to HIGH and back. To turn the pin on or off use the property value. It is boolean. For a test, you must call the program generated with sudo. You can find the link for a download to it at the end of the article. 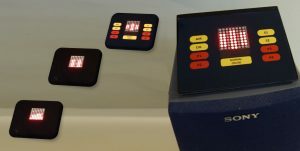 For my mediaplayer I wanted to control 7 single LEDs and a multi-LED (3-color LED) with a changeable sequence. My solution in Lazarus is based on my own class TLedSequence . In this all GPIO pins are packed inside a list. With the method AddPin the GPIO contacts are adjusted in accordance with the description in the above example as an output and added to a TList. The numbers represent the corresponding GPIO names: GPIO14, GPIO15, GPIO18 etc. So the preparations are complete. Now the implementation of your custom sequence starts. We store the information about this in a TStringList . Each sequence – which corresponds to a line in the TStringList – is a sequence of 0 or 1 (on or off) for each of the 7 LED’s. In every other line, another sequence can follow. The code for this is in the method NextStep . It is called regularly by a timer. The best way to test this is with a sample project. 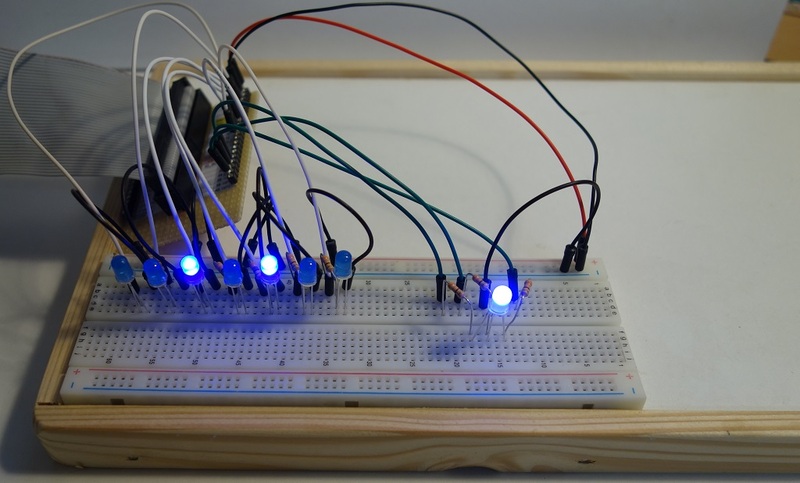 Just connect the 7 LED’s with a resistor on a breadboard to one GPIO pin. I would like to have additional other colors, so a multi-LED is also connected through 3 GPIO pins. The three LEDs of the multi-LED are controlled by another instance of TLedSequence. 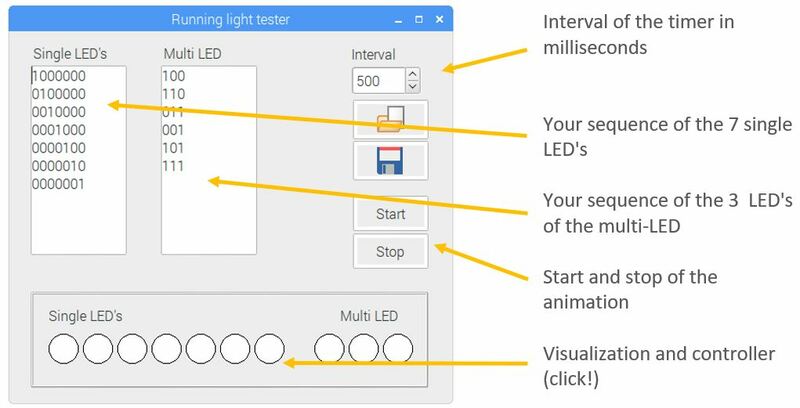 With the example program rlt (running light tester), various sequences can be easily tested. Type in your animation and press Start. You can find the link for a download at the end of the article. If you don’t want to start every program with sudo, you have to allow the user pi to access the GPIO pins. But this have to be done at every re-boot. So it’s better to add the script to the file /etc/rc.local. In the example you see (hopefully) one of the advantages of Lazarus as IDE for the GPIO’s of the Raspberry Pi: The simple visualization ! With a few TShape elements you can built a meaningful visualization. And better than in Python: visually on a form, not only source code. And now a lot of fun testing and further development with Lazarus an the Raspberry Pi! Klicken Sie hier, um diesen Artikel in Deutsch zu lesen.